You can’t escape the theme of the murder and revenge ballad if you have any keen interest in country, folk and Americana music. Whether via traditional song being kept alive through the generations or the contemporary composition, the theme takes on omnipresent proportions. 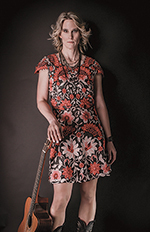 Canadian singer-songwriter Lynne Hanson has chosen the latter route and decided to not just pen a single song, but fill an album with such tracks. The result is a mesmeric collection of seven dark pieces, splendidly assembled under the title 7 DEADLY SPINS. Halloween may have been the orchestrated release day, but there is a timeless appeal to these numbers presenting morbidity in an entertaining way. Lynne first crossed my path several years ago when opening for Gretchen Peters on one of her several Bilston gigs over the last decade or so. Lynne’s lively performance that evening created a lingering memory and this was backed up by enjoying her previous record RIVERS OF SAND. That album received considerable written praise from trusted sources and a similar flow of ‘penned’ love is emerging in the wake of this current release. All seven songs began life as Lynne Hanson inspirations with three of them inviting a little co-written help to reach recording point. Lyrically, the songs peak with the prominent line ‘I sleep with one eye open and a shotgun by my side’, forming the centre-piece of ‘Cecil Hotel’. This is certainly one song venue not on the welcoming list, nor are many other locations where Lynne sets her gruesome tales. Musically, the record is packed with your usual array of sounds blessing the associated genre such as haunting guitars, evocative percussion, atmospheric organ and a few other inventive inclusions.There is a sleazy undercurrent to the first three tracks with the ‘Water’s Edge’ possessing a similarity to the previously mentioned Gretchen Peters on her BLACKBIRDS album. Additionally there are echoes of Gillian Welch, Lucinda Williams and Rosanne Cash detected throughout the record. These associations create an air of positivity around an artist suggesting the blossoming years are ahead of her. The pace and rhythm to the record increases towards it conclusion with a slight raise during ‘Run Johnny Run’ and full on rock ‘n’ roll presenting album closer ‘First One’s Free’. At this point immersion into the delightfully contorted world of Lynne Hanson’s desire to explore eerie themes is complete. ‘Porch music with a little red dirt’ is the perfect moniker attached to her music and this brief collection of undesirable song subjects adds an element of imagination to a lifelong challenge to seek creative literate inspiration. 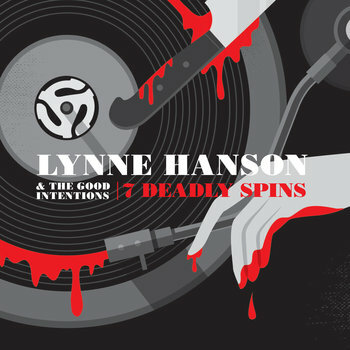 Lynne had stellar help in making this record from her backing band The Good Intentions and a production steering from esteemed fellow Canadian artist Lynn Miles. The pair also worked together on RIVERS OF SAND suggesting that their partnership has been fruitful. Lynne Hanson is set to continue her quest for more UK recognition with a planned visit next summer and there will be plenty of life (or death) left in 7 DEADLY SPINS for it to feature prominently. In the meantime, the album in its recorded format is tantalisingly sitting there for you to make a valuable addition to your collection.